If you are anything like me, then you have bought tons of things from TpT but don't really know what you have. 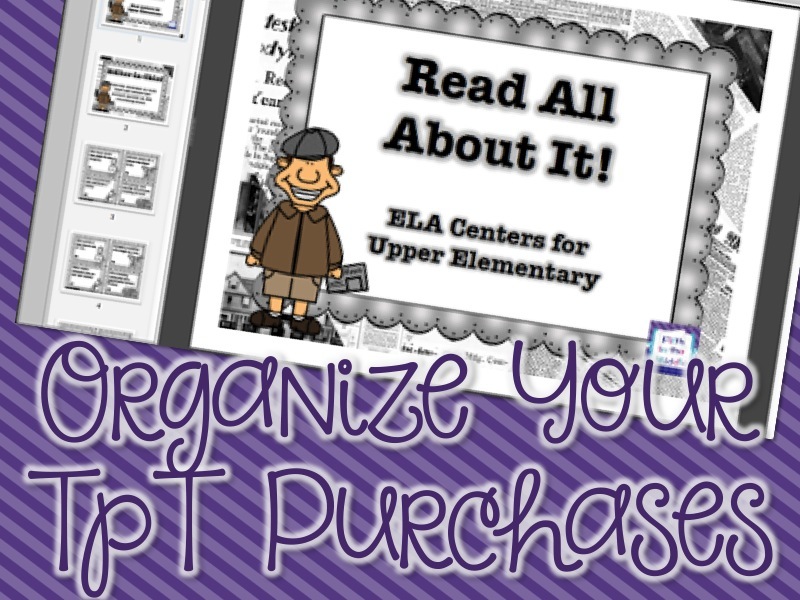 Today I'm going to share with you a way to organize your purchases without printing out everything. 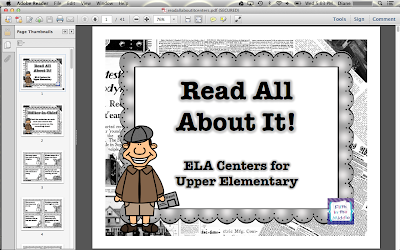 I'm going to focus on PDF files that have multiple components, like ELA centers. It is also possible to do this with PowerPoint, but most of what I have purchased are PDFs. I will also tell you that I'm using Adobe Reader on my MacBook Pro running 10.8.4. Your options might be a little different. So let's say you purchased this fantastic set for your ELA centers, but you don't really remember what skills are included. You are going to change some settings to make a proof sheet. Click on Multiple under Page Sizing and Handling. 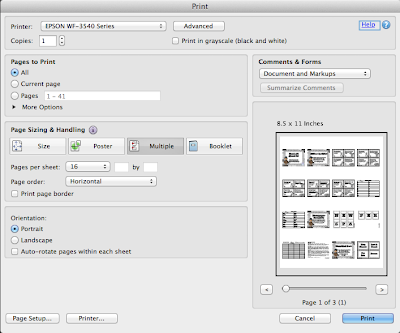 You can adjust the Pages per sheet to whatever you want. I chose 16 for this example. Since there are 41 slides, it will take three pages to print. I can even do two-sided printing to save more paper. After the page is printed, then I write the name of the file on the printout and file in my binder. 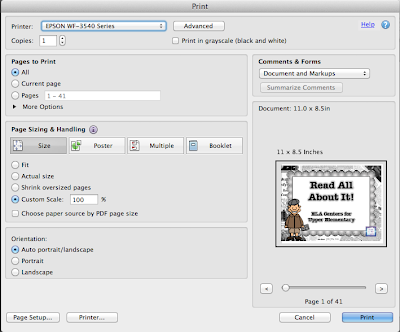 Before you select File-Print, write down the pages that you want to include on the sheet. 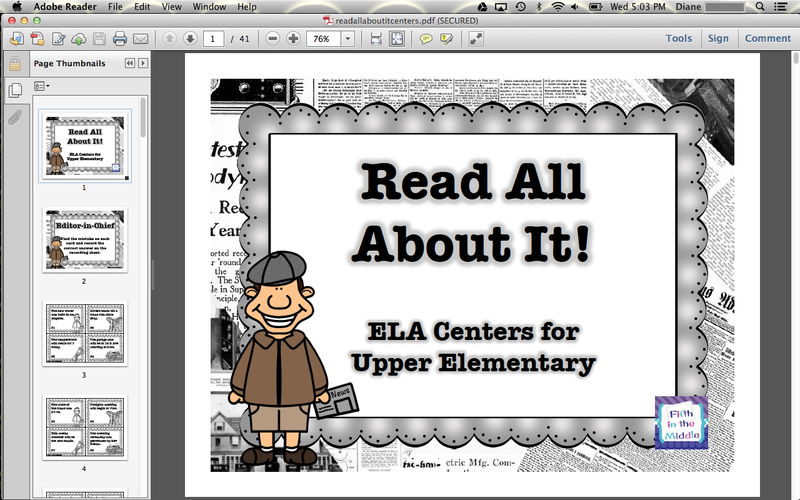 I'm going to include the title page for each center. 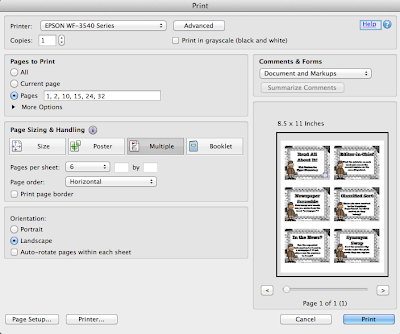 Then go to File-Print to get the same dialogue box as above. 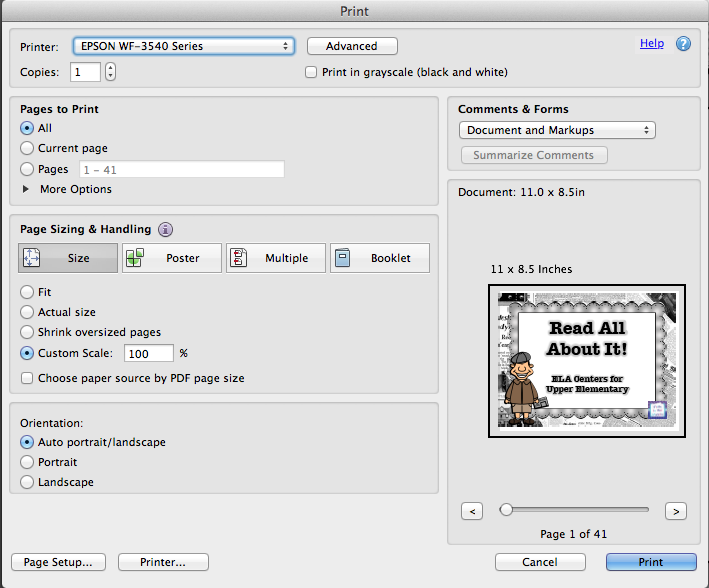 This time, type in the pages numbers you want to include under Pages to Print. 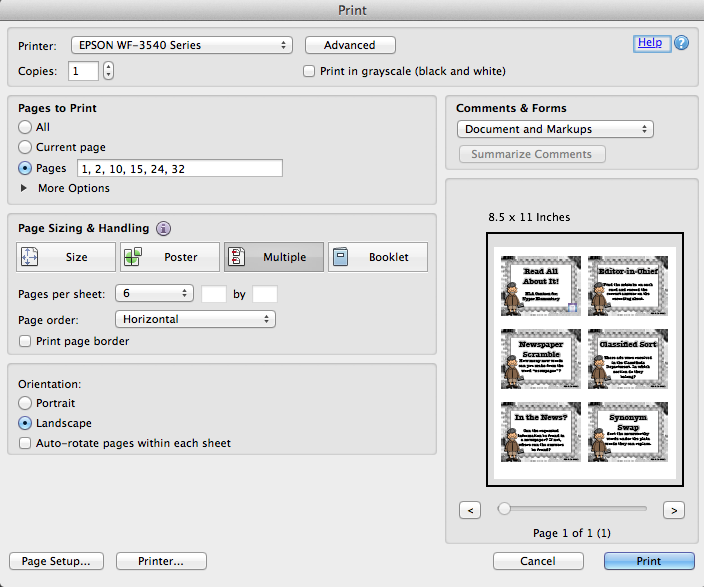 Then I clicked Multiple, and changed it to 6 pages per sheet because that's all I wanted. 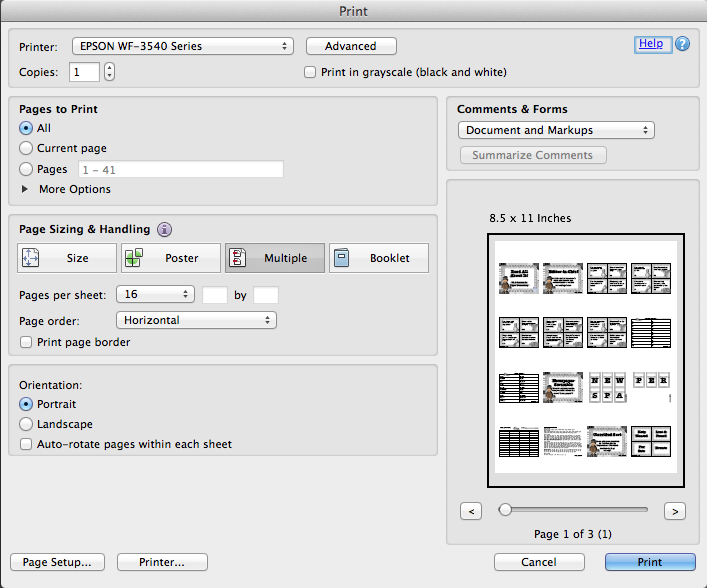 Now it will only print on one page. Print it out, write the file name on it, and file away. Voila! I'm going to try this brilliant idea because I never remember what I have bought! Awesome! I so need to do this! Thanks Diane! You have given me so many wonderful organizational ideas that I just can't go wrong! I believe this may only work for certain printers! I'm not able to do that with mine:( But, thanks for the brilliant idea. You are SOOOOO organized! I need to do this with my teaching items. I have so many on my computer and various jump drives that I forget what I have. Love it! Such a brilliant idea! !